Space shuttle Atlantis (STS-135) touches down at NASA's Kennedy Space Center Shuttle Landing Facility (SLF), completing its 13-day mission to the International Space Station (ISS) and the final flight of the Space Shuttle Program, early Thursday morning, July 21, 2011, in Cape Canaveral, Fla. This story was updated at 6:20 a.m. EDT. CAPE CANAVERAL, Fla. — After 30 years of spaceflight, NASA's iconic space shuttles will fly no more. The space agency's storied shuttle program ended today (July 21) when the shuttle Atlantis soared down from a predawn sky to a picture-perfect touchdown, ending a nearly flawless last mission and the shuttle era at the same time. Atlantis landed for the final time at 5:57 a.m. EDT (0957 GMT). "Mission complete, Houston," Atlantis' commander Chris Ferguson radioed to Mission Control at the Johnson Space Center in Houston. "After serving the world for over 30 years, the space shuttle found its place in history, and it's come to a final stop." "We copy your wheels stop and we'll take this opportunity to congratulate you, Atlantis, as well as the thousands of passionate individuals across this great spacefaring nation who truly empowered this incredible spacecraft, which for three decades has inspired millions around the globe," capcom Barry "Butch" Wilmore said from Mission Control. "Job well done, America." 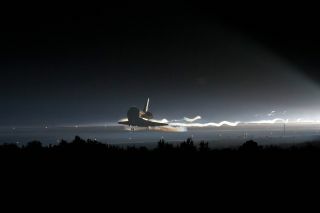 Space shuttle Atlantis is seen on the runway after making a predawn landing at NASA's Kennedy Space Center on July 21, 2011 to end the agency's 30-year shuttle program. It was the 135th and final shuttle flight. It was the 33rd voyage for Atlantis, and the 135th for NASA's reusable winged spaceships. The 30-year space shuttle program, which began with the launch of Columbia on April 12, 1981, is at a close. "The space shuttle changed the way we viewed the world, and it changed the way we view our universe," he said. "There's a lot of emotion today, but one thing is indisputable: America is not going to stop exploring. Thank you Columbia, Challenger, Discovery, Endeavour, and our ship Atlantis. Thank you for protecting us and bringing this program to such a fitting end. God bless all of you. God bless the United States of America." Ferguson led a veteran crew of four on this last mission, including pilot Doug Hurley and mission specialists Sandra Magnus and Rex Walheim. They were the last of 355 spaceflyers to ride aboard the space shuttle over the years. Now that the business of executing this final mission is over, its full significance will likely begin to be felt by Atlantis' astronauts and the wider NASA community. "We have had just an event-filled and packed mission," Ferguson said from space Wednesday (July 20). "We're not going to fully appreciate the significance of the event until after the wheels have stopped." The space shuttle is a pinnacle of complex engineering and robotics, but it is also a very human machine, made possible only through the cooperative work of thousands of people in space and on the ground. "Really the heart and soul of the space program is the people that work in the space program," Magnus said from orbit. "It’s a group of people unlike any other field because everyone's so passionate, so dedicated." "I know that I will feel a sense of completion, as well as a touch of sadness and just reflective reverence of what we've been able to accomplish over these last several years," said Kwatsi Alibaruho, the mission's lead flight director. He predicted feeling "a mix of apprehension, sadness and excitement about what the future might hold, wrapped up into one." In Houston, hundreds of people flocked to NASA's Johnson Space Center to watch the final shuttle landing live on a huge TV screen from the home of Mission Control, where shuttle missions have been managed for the last three decades. On the space station, NASA astronaut Mike Fossum reported that he could see the glow from Atlantis' re-entry from the oribiting lab's Cupola observation deck. NASA’s final space shuttle crew waves American flags celebrating their Fourth of July arrival at Kennedy Space Center for their launch on July 8, 2011. From left to right: Commander Chris Ferguson, Pilot Doug Hurley and mission specialists Sandy Magnus and Rex Walheim. NASA's legacy was tightly wound into this final shuttle flight. Atlantis returned to Earth on the 50th anniversary of the second American human spaceflight — the launch of Mercury astronaut Gus Grissom aboard the Liberty Bell 7 in 1961. The shuttle was in space during the 42nd anniversary of the first Apollo moon landing, as well as NASA's last Apollo mission — the Apollo-Soyuz flight that marked the first international cooperation in orbit. The first American ever to orbit the Earth, famed Mercury astronaut John Glenn, celebrated his 90th birthday during the mission. Shuttle officials have said it is fitting that the last shuttle mission, called STS-135, went to the International Space Station. The football-field size laboratory in Earth orbit is one of the shuttle's prime legacies; it would have been impossible to construct without the shuttle's unique capacity to carry large payloads to space. Though the shuttles are now grounded forever, the space station will continue to operate through at least 2020. Atlantis' last mission was one last chance to drop off 9,500 pounds (4,300 kilograms) of supplies and spare parts to keep the outpost running. The STS-135 mission was the 37th shuttle flight to dock at the space station. Shuttle astronauts have spent a total of 234 days docked at the outpost between the launch of its first module in 1998 and 2011. The end of this mission heralds a difficult time for NASA, where the space agency finds itself without an American vehicle to fly astronauts for the first time since 1975, when the last Apollo capsule flew on the Apollo-Soyuz mission. The gap between the Apollo and the shuttle programs lasted six years, and NASA is now looking at a gap of at least four years between the shuttle era and what will come next. For the near future, U.S. astronauts will ride aboard Russian Soyuz spacecraft to serve their stints on the orbital outpost. NASA is hoping that soon American private space companies will be able to take over the job of ferrying cargo and crew to the station. With the end of the shuttle program and the considerable cost of operating it, NASA plans to devote its resources to developing a new heavy-lift rocket and crew capsule that can carry humans beyond low-Earth orbit. President Obama has charged NASA with sending people to an asteroid by 2025, and on to Mars by the mid 2030s. "The future is bright," Walheim said. "It'll be hard, but we'll get there and we'll be going farther and farther, going new places real soon." The decision to retire the shuttles now was made back in 2004, under President George W. Bush, in the wake of the 2003 Columbia accident that killed seven astronauts and destroyed that orbiter. Another catastrophe, the destruction of the shuttle Challenger just after liftoff in 1986, also killed seven astronauts. The remaining orbiters, Atlantis, Discovery and Endeavour, will now retire to museums. Discovery will go on display at the Smithsonian National Air and Space Museum's Udvar-Hazy Center outside Washington, D.C., Endeavour will be sent to Los Angeles' California Science Center, and Atlantis will come back close to where it started at the Kennedy Space Center Visitors Center. "Many will say the space shuttle program comes to a close," said Bill Moore, chief operating officer of the KSC Visitors Center, during a press conference Wednesday. "For us here at the Kennedy Space Center Visitor Complex, the shuttle program is going to live on in a very vibrant way."